The concept of zero (‘0’, nil etc.) exists in all facets of our existence. It is a common integer used in everyday life, but it is also a significant theoretical and numerical value. It is the beginning, and the end, of anything and everything. In science, particularly thermodynamics, absolute zero (273.15 degrees Celsius, or 0 Kelvin) refers to the point in which all normal fluctuations of matter on a particle level cease to exist and enter the realm of quantum reality. It is a point that scientists have been striving to achieve for decades, and recently have even surpassed. In the world of HIV and AIDS research, many have also been striving to achieve this. A point in which no more deaths would have to result from AIDS and HIV infections will completely cease to exist. It would be the end of the virus and reign in the beginning of a safer, more harm-free world, a world free of discrimination, of injustice and premature loss of life. The stigma suffered by those in third-world countries and by the LGBT community around the world has gone on long enough, and for this there is absolutely zero tolerance. 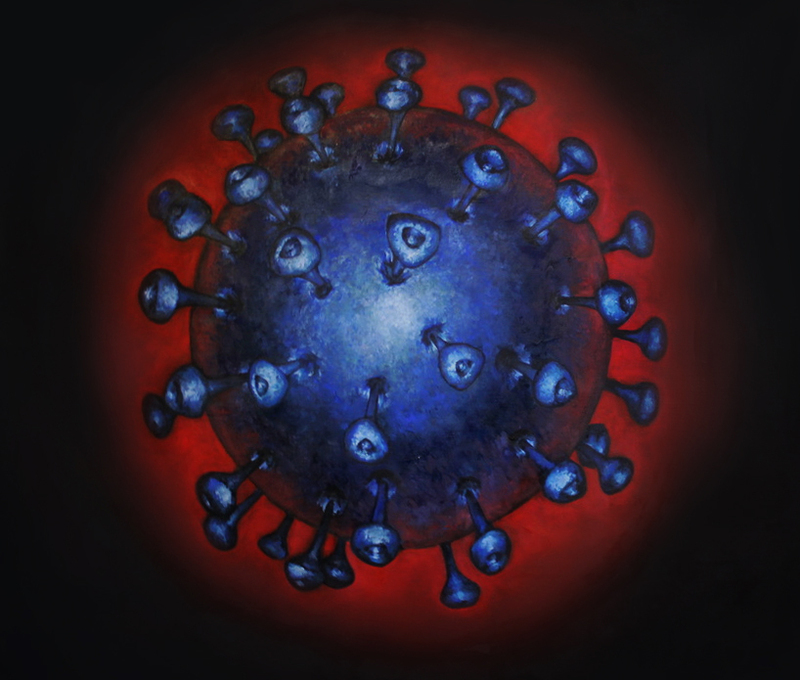 This work refers to the concept of absolute zero by depicting the virus in its microscopic form and isolating it in a state of complete stillness. A stark representation as if it were frozen in an environment were no living organism could possibly survive, but through the viewer’s eyes it is only a window into a world that we believe to be real. Without the lens of scientific knowledge through which we commonly observe these microbial phenomenon, the viewer is confronted with the virus, removed from the understandings of numbers and chemical reactions and into the world of the human condition. Here is where the viewer must confront the virus and battle their own enemy, be it grievance or fear, hatred or naivety, for those are the illnesses all of humanity must face. “Absolute Zero” was completed for the 2016 ZERO Art Exhibition, host by the WAAC on World Aids Day.